The honest-to-goodness chilly, rainy fall days we’ve had lately are perfect for a nice hot bowl of soup. 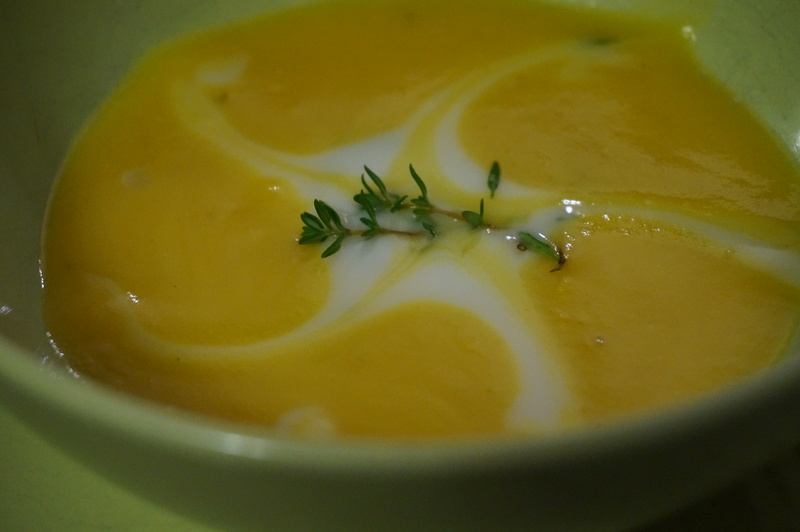 I came up with this tasty squash soup last week, when I just couldn’t find a recipe online or in my cookbooks that I liked and was desperate to find a delicious, quick, easy way to turn my gigantic butternut squash into soup. And then I opened my fridge and saw two lonely, lovely little golden beets (so very different in flavor and character than their show-off red cousins) huddling together in the crisper, and was inspired. 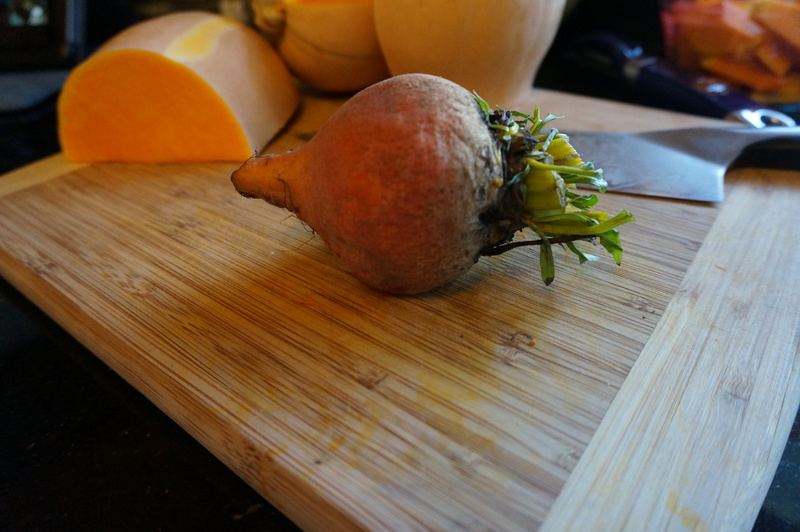 I love squash soup, but it can be a little bland – the golden beets give it a warm autumn flavor, perfect for a rainy day. Golden beet. Tender, mild, and so delicious. This soup is dairy-free. I mention that because it’s such a creamy-looking soup that one might assume it’s made with milk, but it’s not. I’ve been avoiding dairy the last 10 months because a screaming baby is not conducive to pleasant evenings or a pleasant mom, so I’ve had to figure out how to substitute different ingredients in even my tried-and-true recipes. In this new recipe, I used coconut oil instead of butter to brown up the onions, and it adds just a hint of coconut taste to the soup. I think it’s delicious, a delicate complement to the mild flavors of squash and beet; however, vegetable oil or butter, if you’re not worried about dairy, should be just fine too. By the way, I use a lot of coconut oil for cooking, so I get mine at Costco for a wayyyyy better value than you’d find it at a grocery store, where it can be a tad pricey. Optional: Add a dollop of thyme-flavored yogurt to finish off each bowl. If, like me, you’re avoiding dairy, you can get cultured coconut milk to use instead of cow’s milk yogurt – I find mine in the “Non-Dairy” section of my local grocery store. Just stir some thyme and a little honey into it and let it sit at room temperature while you make the soup, then put a generous spoonful into each bowl of soup before eating. 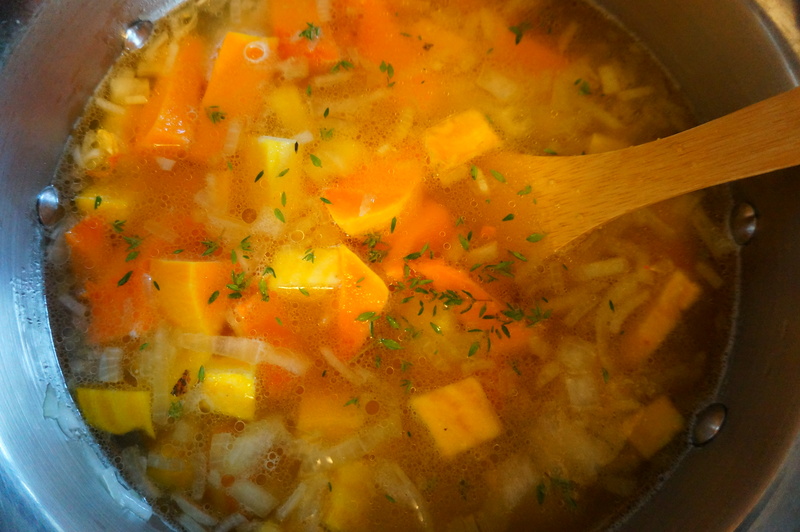 You’ll need a butternut squash (I used about ¼ of a really large one), an onion, a potato, and two golden beets, with 3 cups of chicken broth for liquid. Don’t even think about using red beets. The ghost of my childhood self – forced to endure cold, slippery, sour pickled beets all winter long, their garish juices assaulting the mashed potatoes and meatloaf innocently resting on my plate – will rise up and haunt you if you do. And I don’t even want to think about the color your soup will be if you try a red beet. 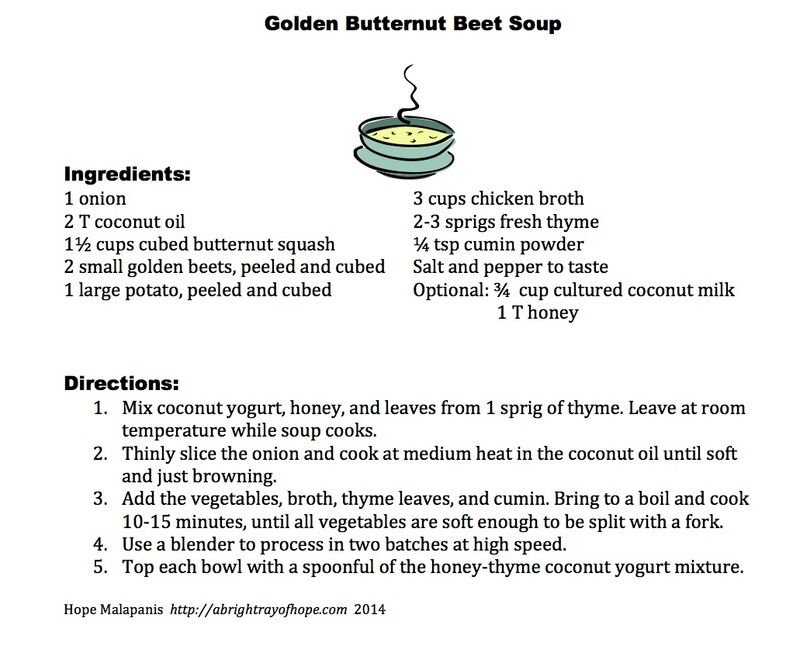 If you don’t have a golden beet, just use a couple of carrots for the added bulk and a bit of sweetness. For seasoning, you’ll need about 2-3 sprigs of thyme and ¼ teaspoon of cumin powder, which is a great balance for the coconut oil you’ll use to brown the onions. Slice an onion. You’re going to be pureeing this, so you don’t have to worry about perfection here, but thinner is better for easy blending later on. Melt 2 tablespoons of coconut oil in a large pot on medium heat. Be aware that it burns fairly easily and melts very quickly – don’t give it too much time to heat before adding your sliced onion. Cook the onions till they’re soft and just starting to brown. While the onion is browning, quarter your butternut squash and peel the quarter you plan to use right now. Leave the peel on the rest so you can store it without losing its freshness. Cut it into ½ inch cubes until you’ve chopped 1½ cups. Peel your potato and the beets as well, and cube them like the squash. Then, add your chicken broth to the pot – I use Costco’s Better Than Bouillon with water – and turn the heat up to high. Dump in the veggies, add the thyme and cumin, and let it simmer until everything is soft. Now it’s time to puree. If you’re new to blended soups, a few words of advice: Don’t blend the whole thing at once, and have a towel ready to clamp down the lid of the blender. The hot liquid has a tendency to cause pressure buildup, and when the blades start whirling, you’re likely to have a mess at best and a faceful of near-boiling liquid at worst. Do half at a time. Drape your folded towel over the lid and hold it down firmly as you turn it on. The hot-liquid effect can be minimized by starting it at a low speed before going up to the highest speed, but trust me: you’ll still need that towel. (You should have seen my kitchen after my first attempt at broccoli-cheddar soup. Not pretty.) An immersion blender works well, too. Blend till the soup is a creamy, rich yellow, and pour the blenderful into a large serving bowl. Do the same for the other half, adjust for salt and pepper, and you’re done. I like to add a spoonful of honey-thyme yogurt to each bowl. It looks pretty and adds a little bit of unexpected flavor to the soup. I served ours with very basic grilled ham-and-cheese sandwiches (no, I didn’t get to have cheese, I just got to inhale while it was cooking), and it was just marvelous. It’s just the right meal to enjoy while leaves are falling and the temperature is slowly dropping. The flavor of autumn, in a bowl.